Released in hardback last year, The Way of Kings was such a weighty tomb that it was decided it would need to be split into two volumes for the paperback version, lest people developed a bad back carrying it home. Reviewed here is the first part of the first novel in the Stormlight Archive, written by Brandon Sanderson. According to legend mankind used to live in a place called The Tranquiline Halls, Heaven - but then the Voidbringers arrived, bringing with them destruction and chaos, capturing heaven and casting out the God's and mortals alike. The men made their home on the world of storms, Roshar. Not content with banishing these souls, the Voidbringers followed them, fighting them in war ten thousand times. 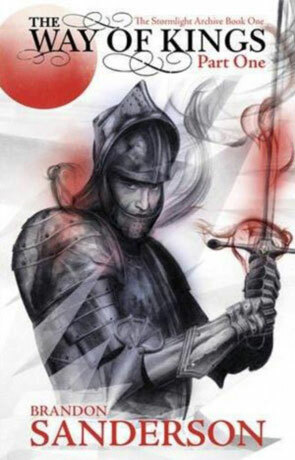 To help the men cope the Almighty gave them powerful suits of armor and mystical weapons, known as Shardblades. Today the only remnants of this mighty conflict are the Shardblades and Shardarmour, the possession of which makes a man nearly invincible on the battlefield. These armour and weapons are of great value as war has raged across the lands for hundreds of years - ever since the Radiants turned against mankind. Wars themselves are fought just over possession of Shardblades, each King secretly wishing that they will be the one who will finally unite all of mankind under a single throne. On a world scoured down to the rock by terrifying hurricanes that blow through every few days is a young spearman ,forced into the army of a Shardbearer, led to war against an enemy he doesn't understand and doesn't really want to fight. What happened deep in mankind's past? Why did the Radiants turn against mankind, and what happened to the magic they used to wield? I must admit that when I first learned that a guy named Brandon Sanderson would be finishing Jordan's epic Wheel of Time series I hadn't even heard of him - Jordan's widow had chosen Sanderson on the strength of his Mistborn series of fantasy novels. Reading The Gathering Storm and the Towers of Midnight I was very impressed with his ability - the way he has managed to seamlessly blend Jordan's voice with his own is nothing short of genius but is still a far cry from creating something from scratch - especially an epic fantasy series. I am glad to say that Sanderson succeeds here too; his wordplay, his worldbuilding and above all his distinct voice are exceptional and quite unique, creating an audible and inspirational series - something of a talent in the crowded sub-genre of high fantasy. There is a serious amount of world building going on in this first volume, but rather than waffle on at length the effective use of exposition means that the pace doesn't suffer any where near as much as it could have. The result is a beautifully rich world with some very unique characteristics, the idea of basing the story on a world ravaged by storms and strong wind is itself genius but the detail that is used really does set the series apart. Unusually for a paperback there are a number of very well drawn sketches between chapters which all adds to the general ambiance. The Magic system is well thought out and is mainly accomplished through the use of Soulcasting and Surgebinding, Soulcasting is essentially changing an object from one form to another, so rock to smoke for example. Surgebinding is a talent that effects gravity, allowing the wielder to attach themselves or something else to another direction (known as "lashing") and as a result effecting the gravity for that which as been lashed, for example lashing yourself to the ceiling would then mean that for you the ceiling was the floor. This ability really comes into it's own in combat and is used in spectacular fashion with some of the effortlessly described fight scenes. Then we have the Spren, these are spirits abroad in the land of Roshar and either cause, or are drawn to different conditions or emotions. There are thousands of variations of Spren, each created for a different condition or emotion - so tiny "fearspren" are attracted to those standing in line as they are charged by the enemy for example while "anticipationspren" gather around those veterans who have shrugged off fear in the face of battle - there are even "alespren" who spring up around those who are intoxicated and "creationspren" who are drawn to works of art at the moment of creation. With one exception the spren are not considered intelligent and are unable to communicate, appearing in size from tiny motes to those as big as a hand. It is explained that these Spren are always present but remain invisible until the relevant action or emotion peaks their interest. It's these little touches that manage to give the world a unique feel, a distinct and rich tapestry that provides an effective backdrop for the story. While on the subject, the story itself is richly detailed and rewarding, of course being the first half of a novel this book mainly deals with introducing the characters, laying down the back story and main story lines, the ending is also handled much better than I imagined it would be and doesn't feel as cut off as it could have. The plot has a real sense of grandeur about it while the pace is surprisingly swift given that a large part of the book builds up this incredible world. The characterisation is also handled well, creating living breathing personas that you can't help but engage with. The Way of Kings Part 1 manages to grip you from the very first page and doesn't let go, it's a powerful and somewhat mesmerising start to a very promising series and one which I intend to follow very closely indeed. Written on 17th June 2011 by Ant.